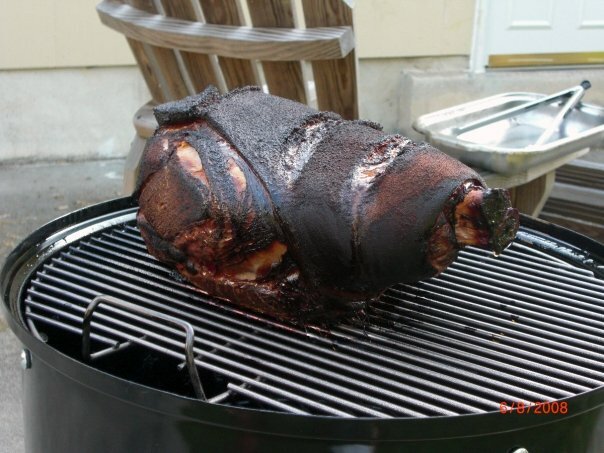 The Easy Pickens Food Blog: Best BBQ Joint in NJ? My own backyard! Since I got my Weber Smokey Mountain Smoker, known to aficiandos as "The Bullet", the best BBQ is the kind I make myself. When I used the Bullet for the first time, I made some videos of the event and put them on YouTube. Viewers of the videos were very generous in their advice and critisisms, for which I was very grateful, as they were instrumental in helping me get to know my equipment and improve my techniques. I posted a link to the videos on some BBQ discussion forums, and got some excellent advice as a result. So, if any of you guys on the "boards" are reading this, thank you! So, if you have a backyard, go get yourself a smoker, and with some practice you can make the best BBQ yourself!